I found this in Pinterest and it looks a lot like my front porch in winter, when we get our "monsoons" and it is so slushy sloshy wet: when Mr. S. threatens to move to Arizona. Years ago when my children were all under the age of 15 they all stood under the porch roof watching the lightening display on a ranch in Texas. I took their snack outside and they always had that memory of watching the rain while they ate. Later on we got the idea of trying to think what it it must have been like for Noah and his family on the ark. The porch became the deck and the house was the ark, so nice and dry inside, and that was a new adventure. Since the ark eventually landed on dry ground, we graduated our adventure to a cruise ship. Each time it rained heavily the house was a cruise ship with all the amenities and employees taking things to the staterooms on trays. Then there was the dinner theatre and the library, the recreation room, and of course the laundry room where the passengers did their own laundry. I still think of this when the rains come and the pouring sky never lets up in winter. 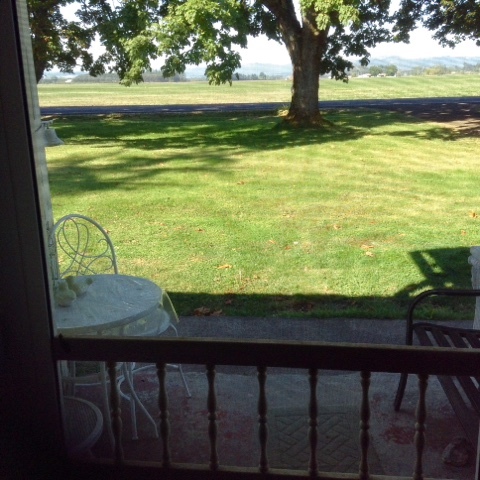 We are still having summer, all the leaves are green and I am not rushing autumn. I am still getting sweet peas, cucumbers and beets out of my garden, and in no hurry for the cold weather. The songbirds are still sending their optimistic spring sounds all day. I found this picture with autumn things, on Pinterest, and I notice how pleasant it is. I got up today and saw my clean kitchen, and enjoyed the peaceful feeling. Whether it's autumn where you live, or "high summer" please enjoy a few leisurely moments while you contemplate the things you need to do or are responsible for today. 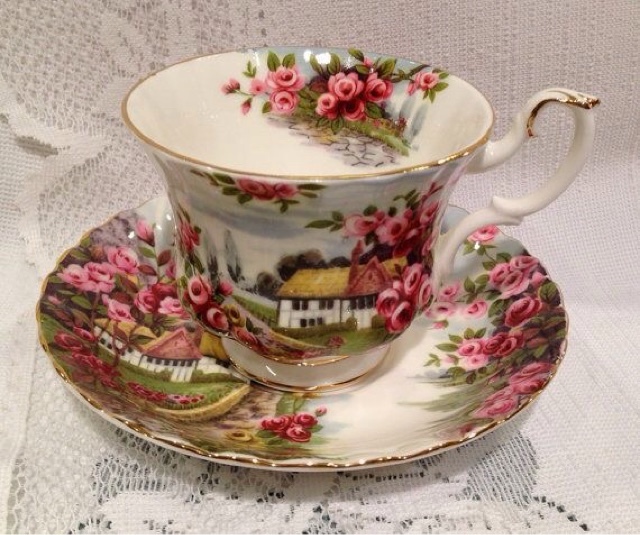 I have looked for cups like this because I love the cottages or houses. 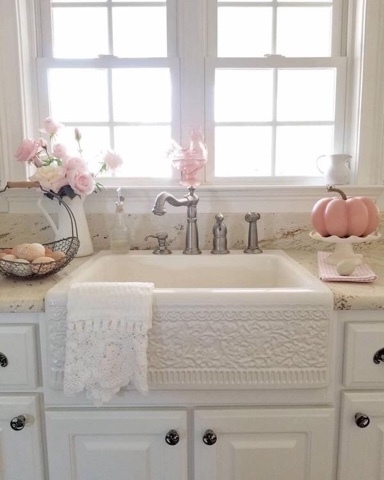 These are quite rare, and I got this picture on Pinterest, but I am hoping there will be some kind of reproduction of patterns like this, that can be found in places like TjMax discount stores. As Fanny said in Sense and Sensibility, "A little cottage is always very snug." 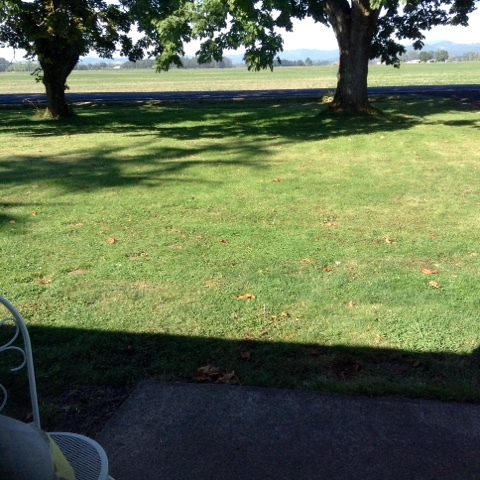 Here are some of my own porch views today. Beautiful cup. I love the quote,and what WONDERFUL memories of your children! ALL of your pictures both from another source and your own, today, are just gorgeous!!!! 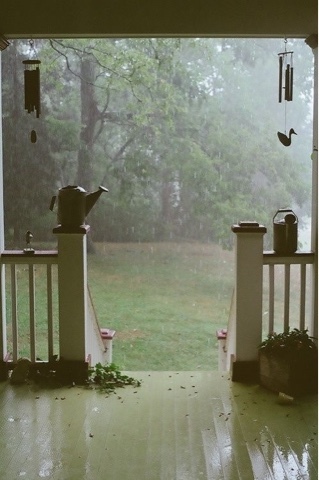 Hi again...I too had rainy day porch sittings at my Southern aunt's home in Petersburg, VA. It was wonderful...something special about sitting on a screened-in big porch with big white pillars to 'make your day', as a child. Lydia, I enjoyed your letter today. A lovely, peaceful post. I am tired today and this helped. Thank you. I have many wonderful porch memories. The smell of the rain was one of the best. Thank you for bringing those memories to mind. I saw a beautiful Royal Vale teacup and saucer called English Thatched Cottage. You might would like it.